Week 2 – Our Safari Week! What a fun week we had with our Safari theme. We all had fun exploring different animals and where they live in so many different ways. 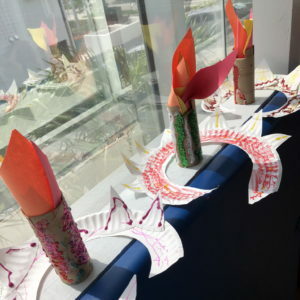 Not only did we do lots of learning and playing, but we created fun crafts such as binoculars and vests using recycling materials, such as binoculars and vests, that we used during other activities throughout the week. We did yoga activities based on animal movements, and experienced food by creating giraffes, snakes and other animals using different fruits, bread and other food items. Great way to explore food for those who love it, and for those who tend to avoid new food items. Scavenger hunts where all about fostering thinking and problem–solving skills. Our exploratory campers had to figure out clues to figure out what animals were hiding for them to rescue. Activities about animals were a great motivation for our explorers to engage in writing and coloring activities. What a blast we had with this jungle safari adventure! Week 3 – Celebration Week! Last week it was all about celebrating our 4th of July. In preparation of all the excitement and overflow of sensory activities our campers were going to be exposed to during the Independence Day celebration, our explorer campers engaged in many activities aimed at giving them opportunity to prepare them to what was coming up, and to practice self-control. On Thursday, after the 4th of July, our older campers planned and organized a celebration party we were having on Friday, while our younger campers practiced dancing songs and created sensory firework and ornaments for the party. Friday came and we all had so much FUN! Seeing our explorer campers just having such a great time playing with their friends, dancing, playing with balloons, being kids! After all, research indicates that children learn best in an environment which allows them to explore, discover, and play.